*The performance on Sunday, May 5 will be sign interpreted. Assistive Listening Devices (ALDs) will be available May 3-5. Make it a night out and enjoy dinner and the show! 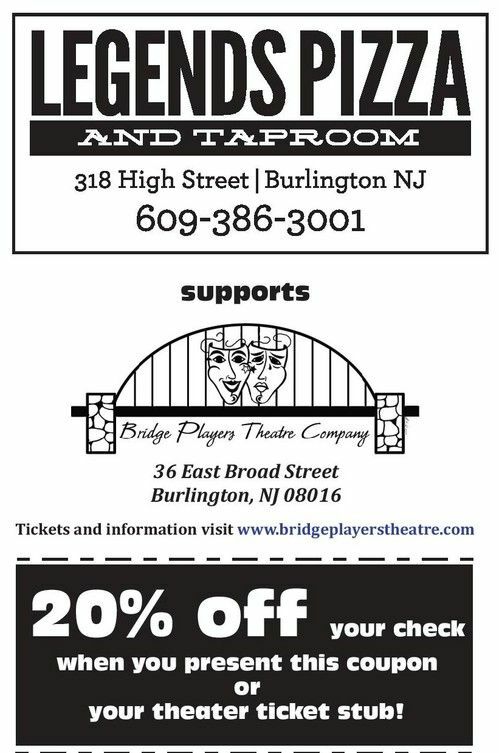 Bridge Players has teamed with Legends Pizza and you can enjoy 20% off your tab. Just print the coupon below or bring in your ticket stub during the run of our shows and present it before you place your order. There are a limited number of tickets available online, and online ticket sales close approximately two hours before each show time. If our online tickets are sold out or closed, that doesn’t mean you have to miss the show! You can pay at the box office with cash, check or credit card. Online tickets are exchangeable, but not refundable. Tickets must be picked up from the box office at least 10 minutes before the performance or may be subject to forfeit.